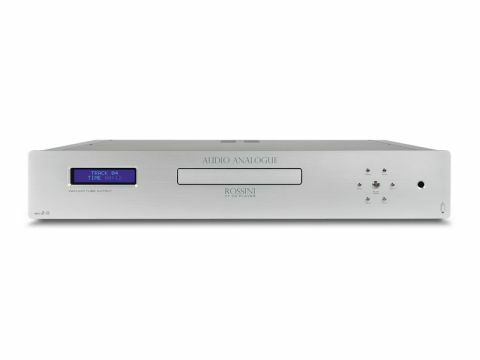 Version 2 of a product can signify something as trivial as a new front panel layout, but this CD player looks distinctly different internally, from the original Rossini. It's unusual in that it incorporates a valve; a 6922 twin triode (one section per channel) in the audio output stage, which is likely to give it some degree of distinctive character. In fact, Audio Analogue acknowledges, with admirable candour, that the valve adds some 'colour' to the purity of digital sound. Those audiophiles who are never quite happy with the high-feedback world of op-amps will appreciate the output circuit, which uses discrete transistors, along with the valve in a low-feedback structure. The disc transport is a CD-ROM type made by TEAC, which has apparently been optimised for audio duty. We don't recall hearing such an idea before, but there's no reason at all why it can't be done. The digital output of the drive feeds what is effectively a complete DAC circuit (so a digital input might be an option one day?) using chips from respected maker AKM. The DAC circuit board is physically separate from the board-carrying power supply and analogue output parts and uses surface-mounted components while the latter uses through-hole types (valve voltages and surface-mount technology don't mix). Ergonomics of the player are OK, if not great: the button layout takes some getting used to (and labelling is small), while the transport is a little slow and clunky and rather noisy in use. Our blind-listening panel quite enjoyed this player, but were not greatly moved by its presentation. Their positive comments mostly referred to the specifics of the sound, rather than overall musical involvement. Praise was also voiced for the deep soundstage and the general sense of space around instruments and voices, something one can't necessarily take for granted even at this kind of price. However, imaging is better with small groups than big ones and our Shostakovich excerpt (as large a bit of orchestra as one is likely to encounter) actually seemed a little reduced in scale compared to some of the group. The most successful track was the Pallavicino madrigal – five solo voices recorded in a generous acoustic, which benefitted from the player's slightly smooth character and made the most of its imaging prowess. This had very good flow and intelligibility and generally sounded natural and lifelike. By contrast, the Ian Dury track lacked some precision in its imaging and didn't really offer the slightly raw impact that it should do. Similarly, the Shostakovich could certainly have done with a little more attack and bite: music isn't always pretty and good reproduction equipment should celebrate that. Tonally the Rossini is assured and even, perhaps a shade restrained in the bass but nicely open in the treble. Detail is mostly good, but again suffers a little in thickly scored music.